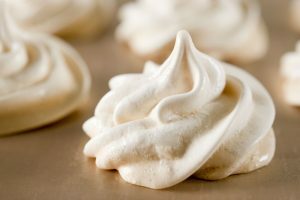 A good blender is an essential appliance in any modern kitchen. With today’s busy lives it’s important to ensure we are still getting a healthy diet while on the go, and blenders are a simple, quick and easy way to ensure you get your daily fix of vitamins and minerals. A simple and tasty way to start the day is with a supercharged fruit and vegetable smoothie. 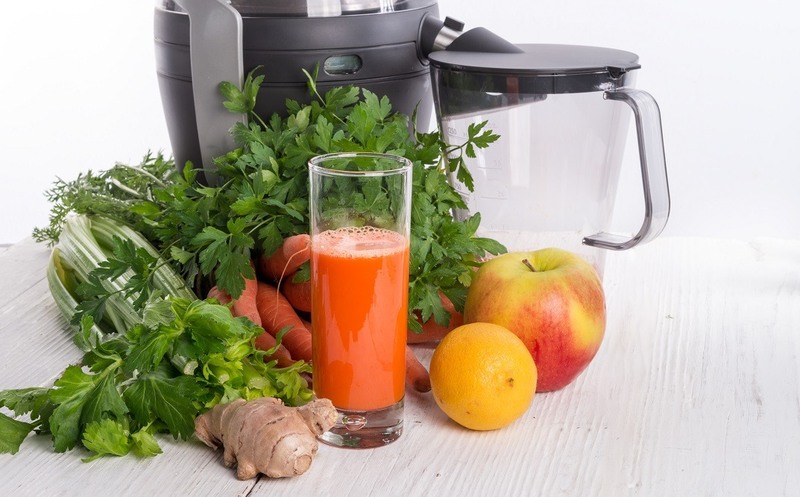 Packed full of vitamins, minerals, and antioxidants, a homemade smoothie or power juice is a healthy alternative to grabbing a coffee and muffin, and takes about the same time with a modern blender. 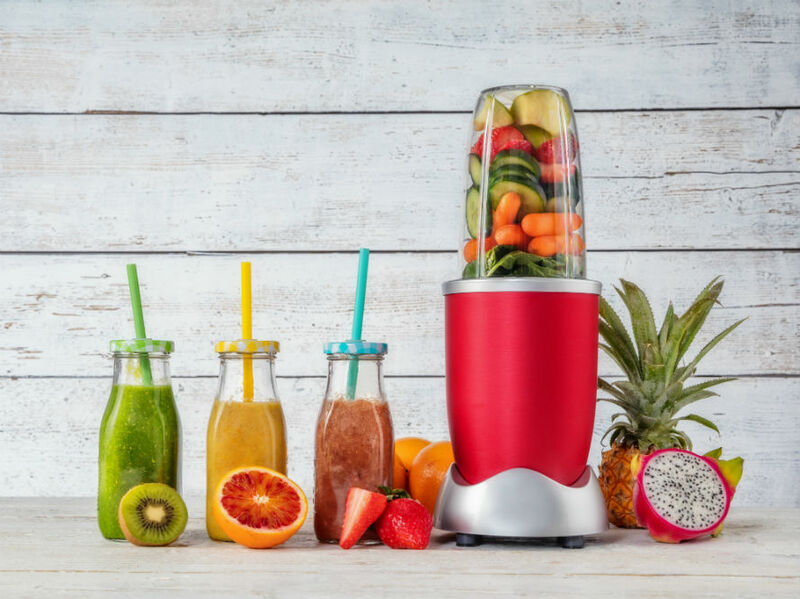 There is a massive range of blender styles available nowadays, ranging from commercial blenders designed for home use, to upside-down Nutribullet-style machines. 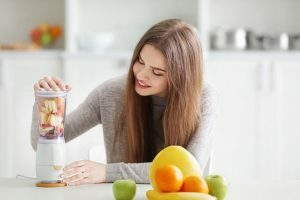 But what is the best fruit blender, for quickly making juices and smoothies and blending fruits to a smooth consistency? 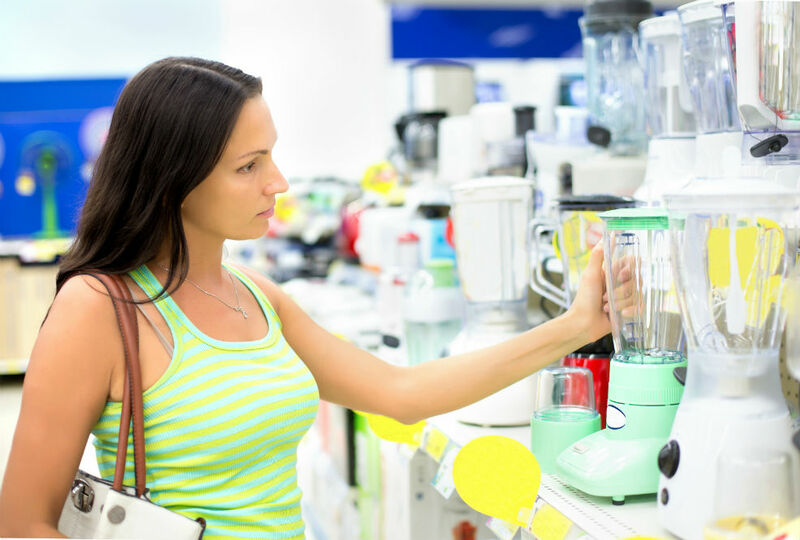 Let’s take a look at 3 of the best fruit blenders on the market, to help you with your choice. The Aicok Single Serve Smoothie Blender is a simple upside-down design, similar in style to the Nutribullet. Featuring a 1200-watt powerful motor, with a speed of up to 2800 RPM at maximum speed, and a cutting speed of 140,000 cuts per minute. 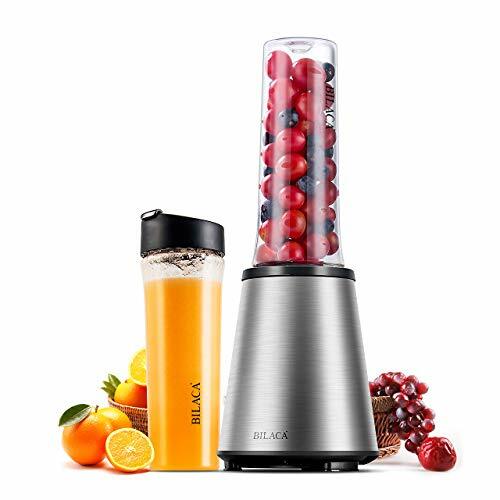 The Aicok smoothie blender uses a unique 6-blade design for maximum performance, and it leaves fruits and vegetables smooth and thoroughly macerated. 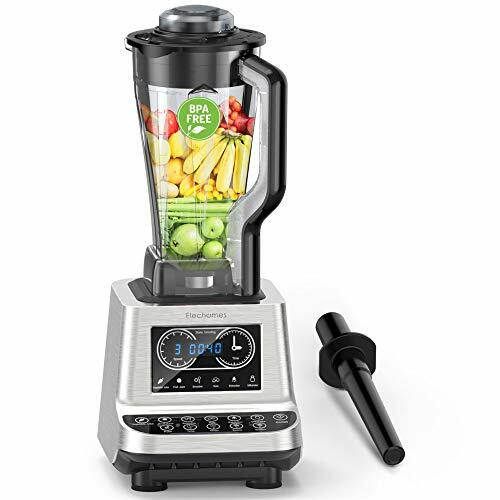 This is a simple fruit blender to operate, and has a one-touch function, as well as pulse mode and power variation buttons. Functionality is actioned via the LED display and is pre-set with timed programs across blending, pulsing and pausing, ensuring there is a program to suit your blending needs. 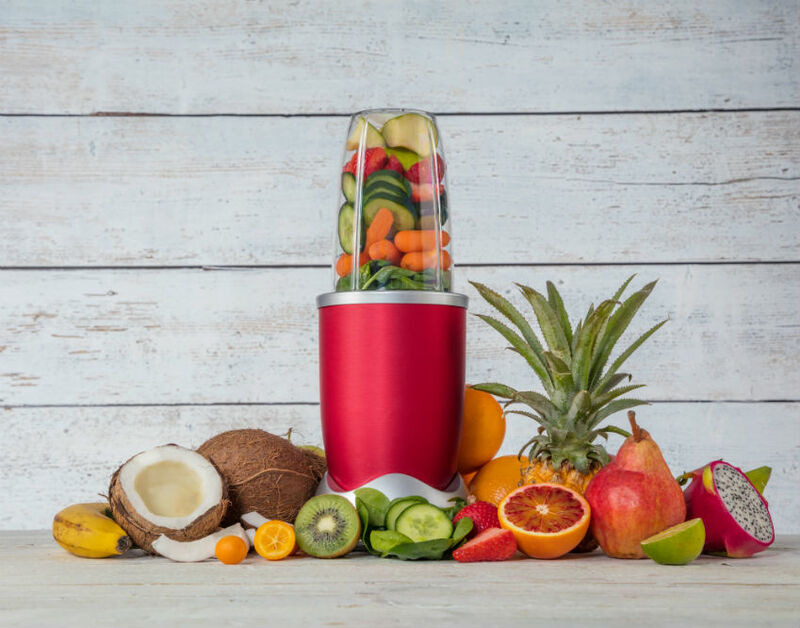 This blender is more than powerful enough to crush ice and blitz through frozen fruit and vegetables. 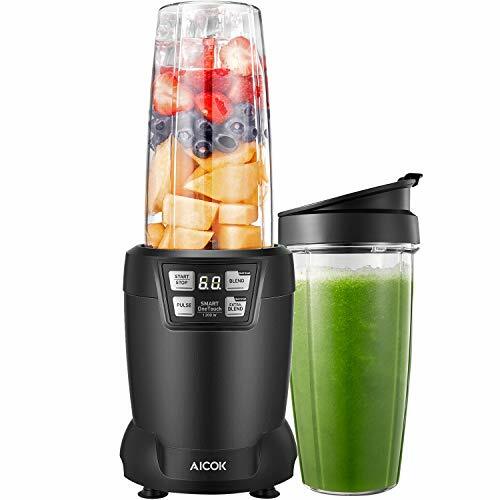 The Aicok blender comes with 2 cups – 35 oz. and a 28 oz. – both are BPA free, and have secure seal travel lids, so you can take your juice and smoothie on the go. 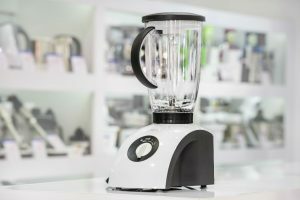 This is a good-looking, good-quality blender that performs well, and comes complete with a 2-year manufacturer’s warranty. The Bilaca Single Serve Smoothie Blender is a super stylish upside down, single serve mini fruit blender. With 2, 18-oz. BPA travel bottles, this blender is made for on-the-go use. The bottle sizes are ideal for taking to the gym, holding freshly made baby food, or adding to school lunch bags. 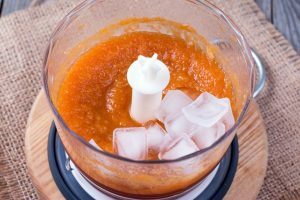 Using a 300-watt motor, this isn’t going to be the workhorse of your kitchen on a daily basis, and we have our reservations on its ability to blend frozen fruit or ice cubes, but it should deal with crushed ice or partially thawed fruit if required. Bilaca market this as a personal blender that is perfect for “on the go” use. It’s certainly small enough to pack in your suitcase and take on holiday, take to the gym, or the office, to ensure you have super healthy and nutritious foods on the go. We found it was particularly good at mixing sports nutrition and breakfast smoothies. So, while it might not be the most powerful machine it is indeed fit for the purpose it was designed for. Super portable mini size, perfect for taking on the go. The Elechomes Countertop Blender 1600W Professional Kitchen High-Speed Blender is a commercial-grade professional kitchen blender, designed for home use. It has a powerful 1600-watt motor that has a top speed of 274 mph and uses a uniquely designed, serrated, 6-blade motor for improved maceration. Elechomes claim this reduces the potential for oxidation of trace elements, ensuring that nutrients stay fresh for longer, giving optimal absorption. 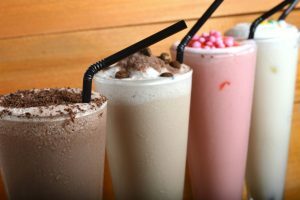 The blender has 10 customizable speeds ranging from 10,000 to 30,000 RPM so you can select a speed suitable for your requirements, and these are displayed for easy use. The base of this blender is made from alloy and is weighted at 12 lbs. to ensure this countertop blender is firmly and sturdily fixed to the worktop during use. The blending jug is a whopping 70 oz., BPA-free, hard plastic jar that is heat resistant, acid and alkali resistant, making this blender perfect for making frozen cocktails for large groups. 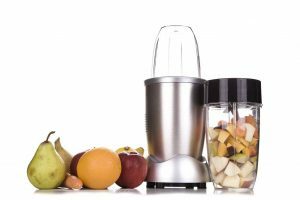 This blender is powerful and will have no problem smashing through ice cubes and frozen fruit, making it a versatile countertop unit. Large size, countertop design, not suitable for traveling or on the go. Blending fruit is a simple way to ensure you are getting the correct number of vitamins and minerals in your daily diet. 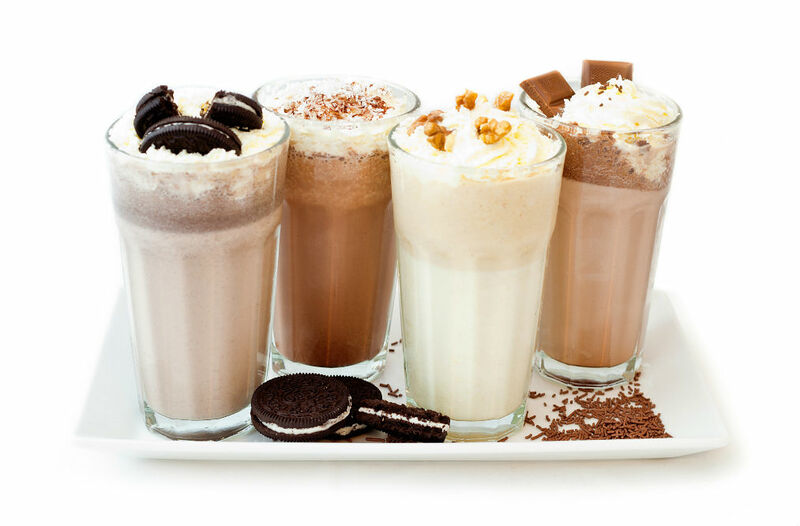 Making juices and smoothies is a tasty addition to anyone’s daily menu. We have reviewed 3 of the best fruit blenders in this review each with its own place and position in the marketplace. The Aicok Single Serve Smoothie Blender is a simple upside-down design similar in style to the Nutribullet, at a more affordable price. It has a powerful motor that will blitz fruit and ice and has a range of household uses. We like the power and the 6-piece blade in this machine, and the fact it comes with 2 BPA free travel beakers. The Bilaca Single serve Smoothie Blender is a super stylish upside-down, single serve, mini fruit blender. This is a great choice if you are looking for a simple solution, that will make smoothies, blend sports nutrition or baby food on the go. It’s a great choice where you require simplicity and portability. The Elechomes Countertop Blender 1600W Professional Kitchen High-Speed Blender is a commercial grade, professional kitchen blender designed for home use. It is a big sturdy machine that will suit large families or heavy users. Whichever you choose we hope you will make good use of your purchase and enjoy the many nutritious benefits of blending.